Spawn: The Eternal - What Happened Where On Earth Did It Go Wrong? Spawn: The Eternal Was A Great Comic Book, Then It All Went Wrong! 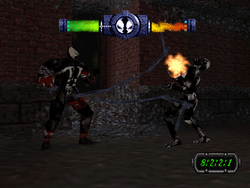 Everyone has their own pet game that they love to hate, who out there has heard of the old 90's game Spawn: The Eternal? If not, perhaps it should be said that perhaps not much has been missed, but some folk including a few here at lexis-games.com are of the opinion that this was pardon the pun, one of the best gaming licenses acquired to be spawned, how ironic is that? 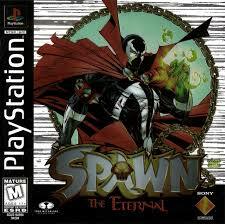 Spawn: The Eternal was a Sony action and exploration game. Were they trying to run before they could leap? Being one of their earlier attempts, it may be fair to say that perhaps they were trying to find their feet with such a genre, and it didn't quite turn out as planned! A lot of casino slots today are inspired by games . One only has to look at Net Entertainment's recent Dracula release to see that there is a vying market ready to engage in a game that is artfully put together that not only incarnates the nuances of the main characters involved, but also in their particular case captures some of the effects rendered by the movie itself. This was not the case with Spawn unfortunately, then again as stated it was the nineties. One of the complaints which could be seen and perhaps since taken on board by some gaming developers is that it was more based on the bestselling comic book than on the movie, also whilst trying to perform simple manoeuvres with the controls, there was frequent unpredictability in the outcome! The textures of the game were sloppy and grainy and it's been said that the hero looked like an ape wearing a costume, which brings back to mind an old John Belushi movie, where the guy chasing him has been knocked out and placed in a gorilla costume in a cage and with a taped mouth couldn't make himself understood to be rescued! Mmmm, thinking about it, now that might make a good game, any takers!